When it comes to baking, I like a challenge...as long as the end result is edible. Having already "veganized" several of my favourite recipes, I am now taking on the challenge of developing gluten-free vegan recipes that are tasty enough to serve to gluten-eating folks. 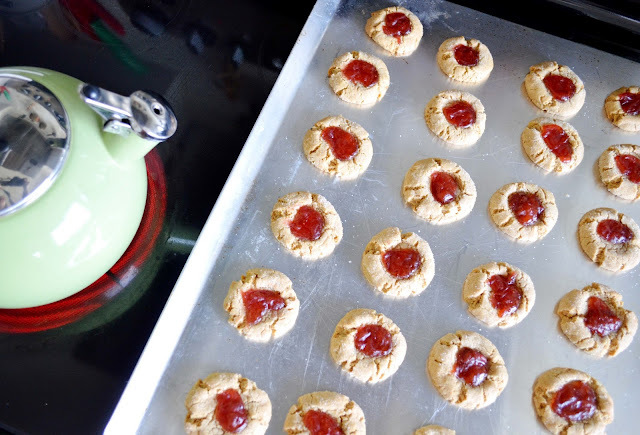 One of my favourite cookies is the peanut butter and jam variety, so I decided to find out just how well they translate to gluten-free. With the help of some gluten-free all purpose flour, a little xanthan gum and some egg replacer powder, I prepared the dough. Of course, I rolled the cookie balls in sugar, because I'm decadent like that. I baked the cookies for 5 minutes, made indentations, put 1/2 tsp of strawberry jam on each cookie and returned them to the oven for 10 minutes. If you will be serving the cookies to somebody on a strict gluten-free diet, be sure to check the labels on all packaged ingredients. I could hardly wait to try them. The cookies were barely out of the oven when I had the kettle boiling for tea. I'm happy and a little bit sorry to say that they were delicious. Happy because I wish to help you discover a new favourite gluten-free and vegan peanut butter treat. Sorry because I ate three of them...in the morning...and a few more later. Serve these gluten-free peanut butter and jam cookies to the most skeptical friend or relative and watch them devour them with glee. They will never know they are vegan and gluten-free. My kids sure didn't. Do you eat gluten-free treats? What's your favourite one? In a medium bowl, stir together flour, xanthan gum, salt and baking soda. In a large bowl, whisk together peanut butter, melted margarine, brown sugar, egg replacer mixture and vanilla. Add the dry ingredients to the wet ingredients and stir together until dough forms. Form 1-inch balls with a spoon and your hands. 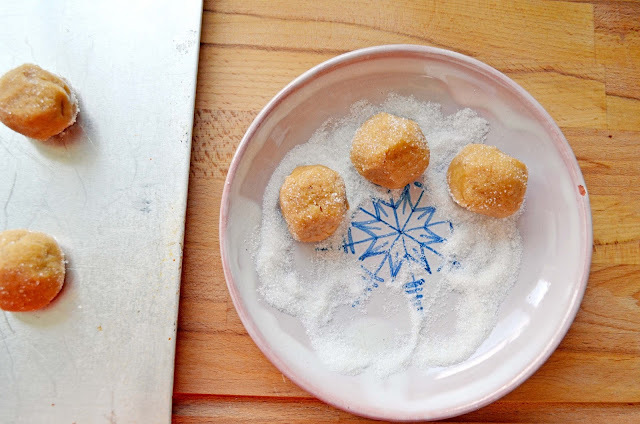 Roll each ball in sugar and place on a baking tray. Bake for 5 minutes. Using a small spoon, make a small indentation in the middle of each cookie. 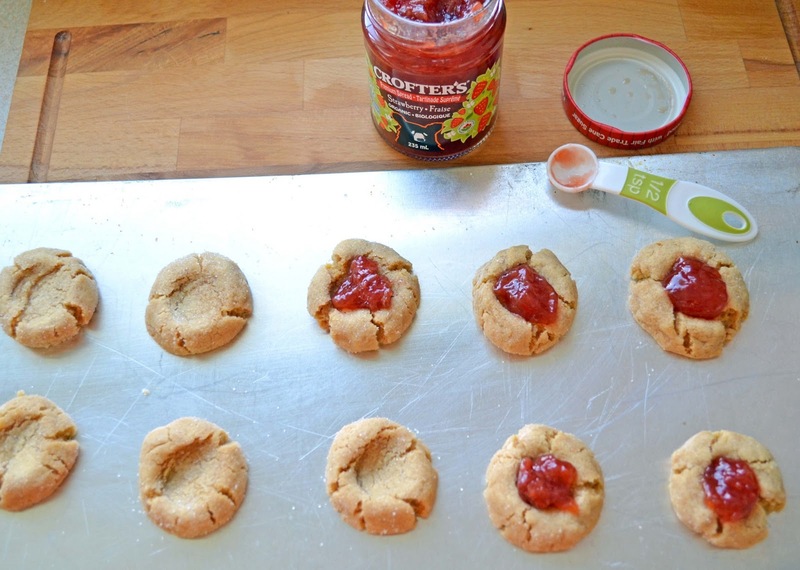 Fill each cookie with 1/2 teaspoon of jam. Return cookies to the oven and bake for another 10 minutes until golden. Wow. Now those look tasty!! I just love peanut butter cookies in general. These look really delicious! 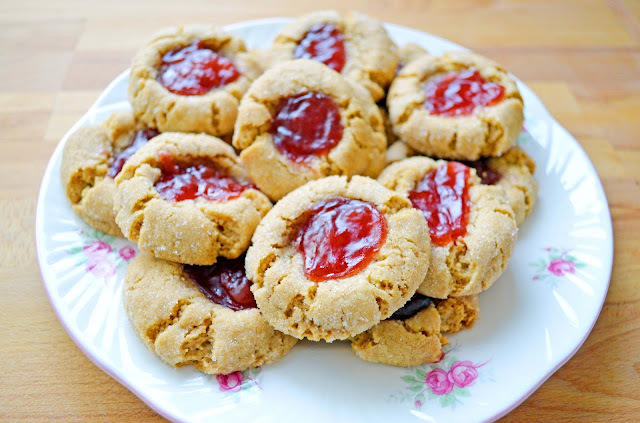 I love the combination of peanut butter and jam and can't imagine how tasty it would be in cookie form. I'll definitely keep this recipe in mind if I need to cook for any gluten free folks. You are funny. :) I lost count of how many of these I ate - lots! I temporarily forgot about my waistline...just until all the cookies were gone. oh my goodness!! these look amazing!! I am so making these tomorrow! Awesome looking recipe. Any ideas on how many eggs to use for those GF folks not vegan? Thanks. Thanks Kelly. One egg will do. Enjoy!